Singapore’s postal service provider SingPost is rolling out 50,000 NFC tags to delivery and collection points across the island and is to equip 1,000 postmen with NFC smartphones to “raise postal service quality and improve operational efficiency”. “Amalgamating NFC, RFID, digital imaging and electronic notifications, SmartPost will equip SingPost’s postal staff with new skills and tools to elevate their operational capability and efficiency across the entire postal operation — from collection to sorting, last mile delivery and quality assurance,” SingPost says. “The first phase will focus on delivery of registered mail, SmartPac and other trackable postal items. Postmen will be issued smartphones loaded with a customised postal delivery app. Used in conjunction with NFC and serialised code scanning, the app will help postmen keep track of deliveries made and generate real-time prompts of standard operating procedures. 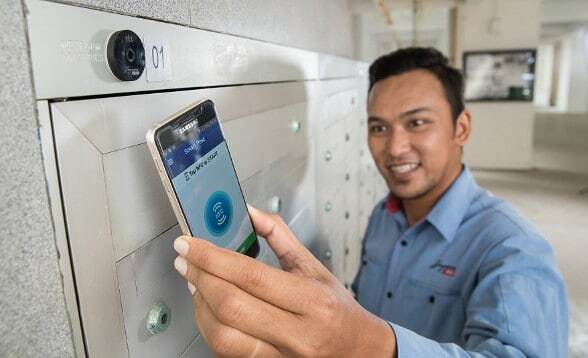 “Apart from equipping SingPost’s over 1,000 postmen with smartphones, NFC tags will be installed on more than 50,000 delivery and collection points across the island, which would make SingPost one of the first postal organisations in the world to do so,” the company adds. “Data of crucial operational activities ranging from posting box collection to letterbox delivery can be obtained, enabling extensive and dynamic analytics for future customer service enhancements and operational work process improvements. “SmartPost is one of many innovations SingPost is using to exploit and leverage the proliferation of digital technology, this time to address traditional postal challenges and take a disruptive step forward to meet evolving expectations for faster and more flexible deliveries, especially for ecommerce,” says Paul Coutts, SingPost’s CEO.